Jazz guard Kyle Korver is dealing with some concerning knee pain ahead of Sunday’s Game 1 against the Rockets, tweets Andy Larsen of The Salt Lake Tribune. Korver, who’s listed as available to play, appeared to cut short a normal shooting workout on Saturday due to the pain. Korver shot 38% from behind-the-arc in 54 games this season with Utah, averaging 20.1 minutes per contest off the bench. Jazz center Rudy Gobert met a statistical threshold determined by his minutes divided by his rebounds, earning a $250K unlikely incentives, per Marks. If Gobert also earns a spot on the NBA’s All-Defensive First Team and secures a $500K likely incentive, his cap hit for 2019/20 is set to increase from $24.75MM to $25MM. Jazz assistant Alex Jensen interviewed for the head coaching position at BYU this week, league sources tell Tony Jones of The Athletic (Twitter link). Jeff Goodman of Stadium (Twitter link) first identified Jensen as a potential frontrunner for BYU. The Wizards will be vying this spring with the Suns, Pelicans, and possibly the Timberwolves for general manager candidates. And while Washington may not have the promising cap outlook or collection of young players out of those teams, it still may be considered the best opportunity for GM hopefuls, writes Ben Golliver of The Washington Post. Leonsis says there’s no list of candidates yet to replace former president of basketball operations Ernie Grunfeld, but league executives tell Golliver that the search figures to include “past and present top decision-makers, as well as up-and-coming executives.” Besides some of the names already mentioned as candidates, Golliver identifies Thunder vice president Troy Weaver and Jazz assistant GM Justin Zanik as a couple more options for the Wizards. Firing Grunfeld was the right move, but the Wizards did it for the wrong reasons, contends Tom Ziller of SBNation.com. In a separate article for The Washington Post, Golliver writes that a number of Grunfeld’s personnel missteps continue to loom large over the franchise. Speaking of Wall, even though his Achilles injury is bad news for the Wizards, there’s a possible silver lining, writes Candace Buckner of The Washington Post. As Buckner outlines, the franchise will only be on the hook for 20% of Wall’s 2019/20 salary until he returns to the court, with insurance picking up the other 80%. Of course, Wall’s full super-max salary (projected to be worth $37.8MM) will still count against the cap. Wizards forward Trevor Ariza is likely done for the season due to his groin injury, tweets Chase Hughes of NBC Sports Washington. The team has previously expressed interest in retaining Ariza – an unrestricted free agent this summer – beyond this season, but it’s not clear how the front office shakeup will affect the veteran. Even though Malcolm Brogdon is sidelined for the rest of the regular season and probably at least the first round of the playoffs, he says the plantar fascia tear in his right foot isn’t nearly as problematic as the torn quadriceps tendon he suffered last year, relays Matt Velasquez of the Milwaukee Journal Sentinel. That injury forced the Bucks guard to miss 30 games before returning just prior to the postseason. Brogdon said he had been experiencing plantar fasciitis for weeks before suffering the tear March 7. He has already made significant progress toward a comeback, getting rid of crutches and a walking boot last week and doing small exercises to try to rebuild his strength before he starts running again. Finding a point guard to pair with their young talent should be the Bulls‘ top priority this summer, observes Sean Deveney of Sporting News. The ideal scenario would be to land the No. 2 pick in the draft and add Ja Morant, and the team is likely to turn to the free agent market if that doesn’t happen. Deveney states that Chicago isn’t in position to compete for top-tier players like Kyrie Irving or Kemba Walker, but may pursue Utah’s Ricky Rubio, a pass-first point guard who doesn’t need a lot of shots to be productive. After a rough start to his NBA career, Cavaliers point guard Collin Sexton has become a candidate for the All-Rookie Team, according to Joe Gabriele of NBA.com. The sad and swift decline in Thomas’ career hit a new low a couple of weeks ago when the veteran was informed by Nuggets coach Michael Malone he would not be in the rotation going forward. Thomas didn’t even make his season debut until mid-February due to his hip condition. He has only seen action in one game since March 8 — a scoreless seven-minute stint in Boston, where his career peaked two seasons ago when he averaged 28.9 PPG. Thomas will probably have to settle for another one year, “show me” contract this summer. Jones has received steady playing time since late February and is now the starter by default with Jeff Teague and Derrick Rose out for the rest of the season. He isn’t much of a scoring threat but he rarely turns the ball over. He’s averaging less than one turnover per game in 25.8 MPG this month. Teague has a $19MM option on his contract for next season and is expected to exercise it, so Jones’ starting gig probably won’t last. The Timberwolves can make Jones a restricted free agent by extending a qualifying offer of $3.57MM and that seems likely, given his age and steady hand at the point. The above salary figure doesn’t reflect that Morris was making $8.6MM before he was traded by the Wizards to the Pelicans, who waived him. He seemed to be walking into a good situation with a playoff-bound team but hasn’t made much of an impact. He’s averaging 6.0 PPG and 3.5 RPG in 15.9 MPG in 17 appearances with Oklahoma City. He played just seven scoreless minutes against Indiana on Wednesday. Morris brings enough to the table to be a rotation piece but it’s increasing unlikely he’ll get a starter-level offer on the open market. Jusuf Nurkic‘s gruesome leg injury changes the outlook for Kanter in the short- and long-term. He’ll suddenly be playing heavy minutes for Portland, which signed him as a backup after the Knicks reached a buyout agreement with him on his $18.6MM salary this season. A productive postseason by Kanter should enhance his prospects as an unrestricted free agent. He’s not going to make anyone’s All-Defense team but he’s a double-double machine when he plays half the game. While it seems Kanter has been around for awhile, he’s still only 26 and in the prime of his career. Favors’ $16.9MM contract for next season isn’t guaranteed unless he’s on the roster through July 6. That seemed unlikely from the time he signed the deal but it’s not a given the Jazz will let him go. That salary isn’t outrageous for a starter and the Jazz have plenty of cap room to absorb that salary. Plus, they’d need to have a solid plan to replace Favors, who has posted a 21.9 PER this season. Favors nearly got dealt to Memphis for Mike Conley and Utah could use his expiring contract in a blockbuster trade next season if it retains him. MARCH 28: Exum underwent surgery today to fix the patellar tendon, tweets Tony Jones of The Athletic. Rehab will start right away, but Exum remains out of action indefinitely. MARCH 15: Jazz point guard Dante Exum has a partially torn patellar tendon in his right knee and will be sidelined indefinitely, according to a team press release. Exum’s latest injury was uncovered during an MRI on Friday. He will continue to seek opinions on how best to treat the injury, according to the release, which suggests that he hopes to avoid surgery. Exum is averaging 6.9 PPG and 2.6 APG in 15.8 MPG through 42 games this season. Exum just returned to action earlier this week after being sidelined 25 games with a sprained ankle and bone bruise. He suffered his latest injury during Utah’s game against Minnesota on Thursday. 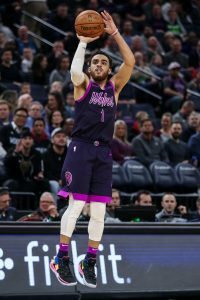 The snakebit point guard missed all of the 2015/16 season with a torn ACL and was limited to 14 regular-season games last season after undergoing shoulder surgery in October 2017. Raul Neto will see his minutes increase behind starter Ricky Rubio in Exum’s absence. The Sixers assigned big man Jonah Bolden to the Delaware Blue Coats, the team’s PR department tweets. Bolden is averaging 16 PPG and 12 RPG in 33.3 MPG over six appearances with the Blue Coats, who play a back-to-back this weekend. The Spurs recalled rookie guard and first-round pick Lonnie Walker IV from the Austin Spurs, according to a team press release. In 28 games with Austin, Walker IV is averaging 16.7 PPG in 27.5 MPG. The Magic assigned guard Melvin Frazier Jr. to Lakeland ahead of the G League’s team back-to-back games this weekend, the team’s PR department tweets. Frazier is averaging 12.1 PPG in 29.8 MPG over 16 games with Lakeland. The Knicks recalled center Luke Kornet from Westchester, the team’s PR department tweets. Kornet is averaging 18.8 PPG and 8.8 RPG in 32.5 MPG over 11 games with Westchester. The Jazz assigned first-round pick and guard Grayson Allen to the Salt Lake City Stars, the team’s PR department tweets. Allen is averaging 17.5 PPG in 31.8 MPG while starting 11 games for the Stars. The Warriors assigned rookie guard and first-round pick Jacob Evans III to Santa Cruz, according to a team press release. In 20 games with Santa Cruz, he’s averaging 11.5 PPG and 2.5 APG in 26.4 MPG. Prior to this season’s trade deadline, the Jazz and Grizzlies engaged in serious discussions about a deal that would have sent Mike Conley to Utah. While the two sides ultimately didn’t agree to terms on a deadline deal, those talks could pick back up in June, front office executives tell Kevin O’Connor of The Ringer. The exact details of Utah’s February offer for Conley aren’t known, but the Jazz were believed to be offering at least a first-round pick and a pair of expiring veteran contracts (Ricky Rubio and Derrick Favors). Memphis reportedly sought a second first-round pick or point guard Dante Exum, and the Jazz weren’t willing to go that high. The Grizzlies moved on from veteran center Marc Gasol at last month’s deadline, signaling that they’re ready to break up their longtime core and retool their roster. In other words, Conley is a good bet to be back on the trade block this summer. However, a report after the deadline suggested that Memphis also doesn’t mind the idea of hanging onto its point guard and building around Conley and Jaren Jackson, so an offseason trade certainly isn’t a foregone conclusion. Conley remains under contract for $32.5MM in 2019/20, with a $34.5MM early termination option for 2020/21. That’s a steep price to pay for a point guard in his 30s, but the former Ohio State standout has been as good as ever this season, averaging a career-high 20.7 PPG to go along with 6.4 APG, 3.4 RPG, and 1.4 SPG. The Jazz, meanwhile, could be on the lookout for a point guard this summer with Rubio set to reach unrestricted free agency and Exum once again plagued by health issues. Thunder star Russell Westbrook will be suspended one game after picking up his 16th technical foul of the season on Saturday, the league announced today. Westbrook will serve his one-game suspension on Monday night against the Heat. League rules mandate that any player who receives his 16th technical foul receive a one-game suspension and a $5,000 fine. For Westbrook, every other technical foul between now and the end of the regular season will result in another one-game suspension. Westbrook, known as a highly expressive player during his 11 NBA seasons, was upset over a questionable no-call in the team’s game against Golden State. Westbrook attacked the basket and drew some contact from Klay Thompson, receiving a technical shortly afterward. The Thunder are battling for a high playoff seed in the Western Conference, currently leading the No. 6 Spurs by one game and trailing the No. 4 Blazers by a half-game. Westbrook’s poor shooting could’ve played a role in his frustration on Saturday, with the 30-year-old scoring just seven points on 2-for-16 shooting. In addition to his fine, Westbrook will lose $245,891 in salary by sitting Monday’s game, ESPN’s Royce Young tweets. The Thunder will save $522,518 toward the luxury tax. Jazz players have rallied around Dante Exum after the 23-year-old suffered yet another injury last week. Exum, who already missed 25 straight games due to injury this year, suffered a torn patellar tendon in his right knee and will be out indefinitely. “They’ve been very supportive,” Exum said, as relayed by Aaron Falk of Jazz.com. “Just every day they wanted to make sure I was right.” Exum, the No. 5 pick in 2014’s draft, has only appeared in 42 games with the team this season.